Inc. magazine today ranked U.S. Pavement Services No. 3920 on its annual Inc. 5000, an exclusive ranking of the nation’s fastest-growing private companies. The list represents the most comprehensive look at the most important segment of the economy - America’s independent entrepreneurs. U.S. Pavement Services experiences 3-year sales growth of 72%. and drive the economy forward. Growth companies, not large corporations, are where the action is,” says Inc. Editor Eric Schurenberg. This is the firth time U.S. Pavement Services has recieved this prestigious award. 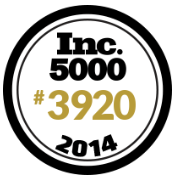 We we listed on the Inc. 5000 list in 2008, 2009, 2012, 2013, and now 2014. Mike Musto, President and CEO, U.S. Pavement Services. For nearly 30 years, U.S. Pavement Services has been providing comprehensive and the most professional pavement maintenance and concrete services in the industry. As the leaders in the pavement industry, our philosophy has always been to provide the reliability and quality workmanship that our customers expect. We have grown to be the leader by focusing on customers’ business requirements, brand objectives, and project goals. Complete results of the Inc. 5000, including U.S. Pavement Services, and an interactive database that can be sorted by industry, region, and other criteria, can be found at www.inc.com/500. For more information about U.S. Pavement Services or to get a FREE property evaluation please visit www.uspavement.com or call 1-800-PAVEMENT.